Palm Sunday is a festive event in which the church commemorates and re-enacts Christ’s entry into Jerusalem, a symbol of his kingship and victorious celebration. It is the beginning of the culmination of Jesus’ life’s work, both in the sense of its fulfillment and its end. It is also, as Jesus knew when he rode into Jerusalem, the entry into his death. As he approached Jerusalem, death approached him. But while this was a triumphal entry, the man for others alone comprehended the true import of his entry and why this victorious moment was a preparation for his death. It was a triumph still to be comprehended by those who followed after him and those who sang him into the city. There was pre-existing hostility to Jesus among the religious and political elites, and this royal entry into Jerusalem at the time of Passover must have stoked further anger among them. 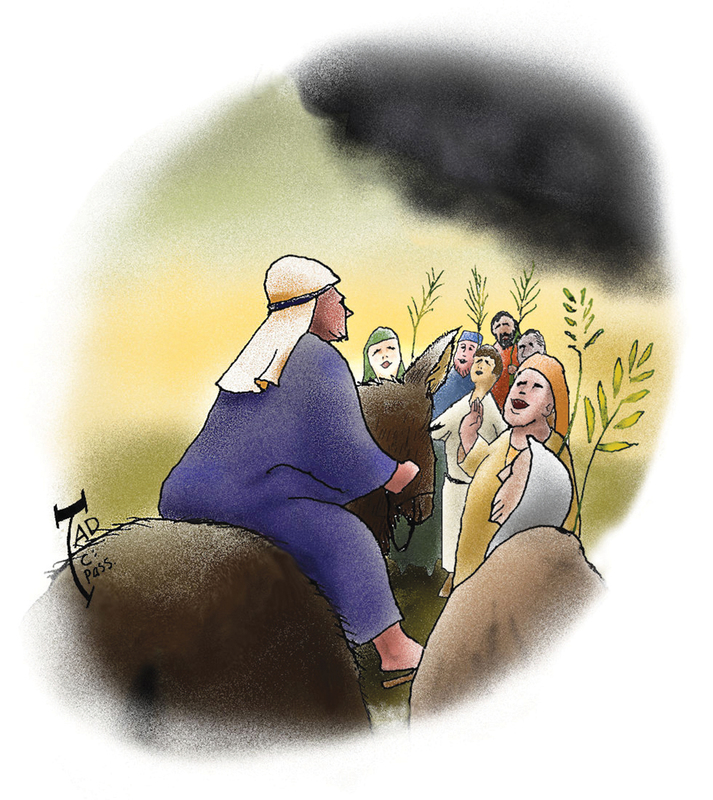 In Luke’s account, some Pharisees ask Jesus to tell his disciples “to stop.” More than stopping the celebration, they must have wanted to stop them from celebrating Jesus’ arrival as the fulfillment of messianic hopes. This celebration of the crowds must have created tension for Jesus himself, who according to all of the Synoptic Gospels created the conditions that allowed the royal entry to take place by having his disciples find the animal on which he would enter Jerusalem. He knew that the joy of his disciples would turn to sorrow, even the joy of his closest disciples, whom he had taught privately about what was to come but who had difficulty grasping the need for the Messiah to suffer and die. Yet Jesus needed them to experience the truth of his joyous kingship before experiencing his suffering and death. For it was only in their own painful rumination on Jesus’ death and their subsequent experience of the risen Jesus that they would fully understand the nature of the Messiah, the savior of all. Jesus alone rode with the weight of that knowledge and the weight of that suffering as he approached his death. Why should it even have been this way? Jesus’ death was an act of pure grace meant for the sins of Israel and the whole world. This death he accepted, knowing that hostility and rejection would come not just from religious elites but from the same crowds that cheered him into the city, and even from some among his apostles, his closest friends. Still, he rode with cheers raining down on him to what he knew was his approaching death. Why should it even have been this way? Msgr. John P. Meier writes that “as a person lives, so that person dies.... Jesus’ message and praxis consisted of radical love for God and neighbor, of humble service and sacrifice for others, even for enemies. This message was based on total confidence in and surrender to the God who was coming in his kingdom as Father. Jesus’ acts of healing, exorcising, pursuing the lost sheep, eating with sinners, declaring sins forgiven, teaching the crowds and disputing with opponents were all concrete expressions of his service of love. Jesus was indeed the ‘man for others’ whose whole life interprets his death—and vice versa” (New Jerome Biblical Commentary, 1326). The one who came offering life was faced with rejection; and his expiatory death on behalf of others, on behalf of Israel and the world, was a response to those who had refused the mercy of God’s son. Jesus’ approaching death, a self-emptying of love, was in keeping with the whole of his life. It was not out of character, but precisely the summation of Jesus’ love for humanity. So, is giving priority to "Charity" only for deacons? I couldn't agree with you more. The constant negative harping, the unrelenting criticism of America, of its editor, of its staff and writers, of the Jesuits, especiallyof the New York province, etc is not only unconstructive, it has become annoying. I am trying to learn to skip past certain comments as they add nothing to the discussion. Just my opinion, of course. This article also appeared in print, under the headline "Dying as He Lived," in the March 14, 2016 issue.